Unite against Trump’s ultra-right racists! 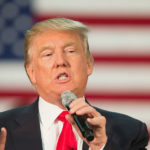 The election of Donald Trump marks an extremely dangerous shift, that threatens peace, democracy and sovereignty abroad, and labour, civil, social, and equality rights in the U.S. As the de facto leader of a fascist movement, Trump has been compared to Silvio Berlusconi, the fascist leader of the Italian People of Freedom Party. The Republicans now control both the House of Representatives and the Senate, and the executive branch, with power to make crucial appointments to the Supreme Court. We are witnessing the rise of a far right political movement similar to several European countries with all of the violent racism, sexism, xenophobia, Islamophobia, homophobia, and transphobia that goes with it. Marine Le Pen of France’s far-right National Front was the first foreign party leader to congratulate Trump on election night. Most Republican electors cast a vote for Trump, despite earlier repudiations by many prominent party leaders. At the end of the campaign, most of them rallied for Trump and for the Republican candidates for Congress and Senate. Other factors included a relatively low turnout, racist voter suppression tactics, the electoral college system which helped Trump win despite a lower share of the popular vote, and the wide prevalence of misogynist and sexist views in the United States. But Trump’s victory also resulted from the inability of Hillary Clinton’s campaign to hold together the broad coalition of forces that led to Barack Obama’s election in 2008 and re-election in 2012, including Black and Hispanic voters, women, labour, and youth. In this campaign, the turnout by Black Americans was significantly lower. A similar albeit narrower coalition had coalesced around Bernie Sanders, a self-styled “democratic socialist.” After Sanders’ candidacy for the Democratic nomination was defeated, many of his supporters opted to stay home even though the Democratic platform included some of his policies. Others voted for Green Party candidate Jill Stein, or other third party candidates, rather than support Clinton, who was widely recognized as a war-monger and a representative of the banks, finance capital, and the 1%. The Democratic Party establishment, which hand-picked Clinton for the nomination, turned their backs on the US working class which faces worsening social conditions, collapsing wages and living standards, and mass permanent unemployment. In the process, the Clinton campaign helped Trump build up his image as an outsider, beholden to no-one, though he was in fact heavily financed and supported by the Breitbart group and alt.right movements, the Tea Party, the religious right, the KKK, the military, police, and secret service, and by reactionary corporate interests who undoubtedly helped to finance the campaign behind the scenes. Trump has never been the lone cowboy he claims to be, either financially or politically. He is the front man for the ultra-right corporate and fascist forces in the US today. The ongoing capitalist crisis since 2008, combined with systematic de-industrialization, plant closures and job losses resulting from global capitalist trade deals such as NAFTA and the upcoming TPP, has created a tipping point. Unwilling to continue with the status quo, working people have become increasingly angry and bitter, demanding change. The field was wide open for the demagogic ultra-right to offer their alternative: attacks on immigrants, racialized communities, Muslims, women, and unidentified elites, including trade unions and equality seeking groups and legislation blamed for the crisis in the country. “Make America Great Again” was Trump’s broad stroke promise to improve the lives of unemployed and unorganized sections of the white (male) working class and ruined small business people, and to wreak revenge on those held responsible for their situation. Trump’s promises to create jobs and raise living standards are fantasies for the public. His agenda is to lower corporate taxes, eliminate regulation of corporations and banks, slash education and healthcare, privatize public assets and services, scrap civil, labour, equality and democratic rights, expel immigrants, repeal “Obamacare”, appoint judges who will attack reproductive rights, and rip up the Paris Accords and other efforts to tackle climate change. He will be in charge of the US nuclear weapons codes, and he proposes to double military spending. There will be no breathing space under Trump, who will continue the imperialist policies of previous presidents, including new wars in the Middle East and Central Asia, continued aggression in Africa, regime change in Latin America, and the NATO drive to encircle Russia and China. Living next door to the tiger, Canada will not be immune. US investment and control runs right through the Canadian economy, our energy and resource extraction policies are very similar, our environmental policies are almost as bad, and Canadian foreign policy and support for NATO is in lock-step. Where there are differences, the US always prevails. This will include any amendments to NAFTA or the TPP, or the Keystone Excel Pipeline and other pipeline deals. Facing this onslaught, working people in Canada and the US, and especially the trade unions, must organize to defend hard-won rights and standards, and to mobilize broad-based unity and mass independent political action in the streets to stop Trump and the ultra-right in their tracks. Unity of the Canadian labour and people’s movements with our counterparts in the US will strengthen this fight in both countries. The Communist Party of Canada stands in solidarity with those who voted against and fought to defeat Trump, and with the Black Lives Matters movement, the Standing Rock water protectors, and all other post-election struggles against the ultra-right, in the US, Canada and globally. To succeed, this fight must include a program and policies for the real, fundamental, and progressive change that working people are so desperately looking for. In the meantime, unity, unity and more unity is what we need in this struggle. The people united, will never be defeated!